Miss Moore Thought Otherwise by Jan Pinborough is a true children’s story about one of the first children’s librarians. Anne Moore grew up in a time where many libraries were not free, and they were certainly not meant for children. Usually, children were not even allowed inside, especially girls. But Miss Moore thought otherwise. Anne Carroll Moore was an independent thinker ever since she was a child. While other girls stayed inside and sewed, Anne was outside sledding on the hills. When other girls got married, Anne was working in her father’s office, learning how to be a lawyer. When other women stayed home, Anne moved to New York City, went to college, and got a job in a library. Anne Moore changed the ways in which libraries viewed children. Under her supervision, libraries no longer demanded silence from patrons, children were allowed to take books home, child-sized furniture was built, more children’s books were published, rooms became more colorful, and people were brought in to do children’s programming. Libraries all around the world followed her example, all because she always looked at things differently. Can children read this? Yes. This book is appropriate for all ages. There are interesting things for the older kids to read, and the younger kids will enjoy the beautiful pictures. Who would like this? Anyone who is interested in how children’s libraries developed into their current focus on library users, and anyone who enjoys learning about strong women. Did you know that the Children’s Department at the Cheshire Public Library visits almost every preschool in Cheshire once a month? Did you know that Cheshire Birth-to-Three child development experts visit library programs to answer questions caregivers have? Did you know that the library participates at local festivals such as Fall Festival, Strawberry Festival, Touch-a-Truck and more? Over the past two and half years the Children’s Department has been partnering with local organizations who serve youth to share resources, expertise, and reach more people. Below is a brief summary of a few of our partners. Cheshire Birth-to-Three program has a highly qualified and experienced staff consisting of a physical therapist, occupational therapist, speech pathologist, social worker and special education teachers. The staff makes home visits to provide speech, physical, occupational and/or educational services. In addition, B-3 hosts the Parent/Child Resource Center which is a playgroup for children ages 0-3 and their parents. If you have concerns regarding your child’s development, either attend the Parent/Child Resource Center at Darcey School (call for times 203-272-9108) or call Infoline at 1-800-505-7000 and request the Cheshire Birth-to-Three Program. The Birth-to-Three Team can conduct a complete developmental evaluation in your home. Artsplace provides a creative environment for students to explore their artistic endeavors. This is possible with our fantastic teaching staff (many national award winners) of over 20 professional artists. Art classes and workshops are offered in a wide variety that are suitable for all ages and levels. The youngest Artsplace student is three and the oldest is ninety nine. Artsplace is a most uncommon art school in that standard supplies are provided for all classes. The Cheshire Parks and Recreation Department offers a wide variety of activities to the residents of Cheshire and maintains the beauty of the many parks in our town. The department maintains and schedules six major park facilities, the Youth Center, and the Community Pool. Visit their website to find classes and other activities for yourself or your young one. They offer everything from adult yoga to toddler music classes. Visit here to learn more. The Cheshire Community YMCA is the premier child care provider by offering a safe and nurturing environment in which children are encouraged to develop social skills through age appropriate curriculum. They offer everything from enrichment classes for youth, preschool to aftercare for elementary school students. Visit their Child Development page to find out more about their youth services. Musical Folk offer Music Together® Program, Ukulele and Movement classes! Have you ever wondered what you can do to nurture the musical growth of your child, regardless of your own musical ability? Experience Music Together and find out how important–and how fun–your role can be! Music Together® classes build on your child’s natural enthusiasm for music and movement while developing important musical, social, cognitive, physical & language skills. If you’ve visited the Children’s Department of the Cheshire Public Library you’ve probably noticed the large amounts of toys we have. We love to see kids play and love to see them playing with their caregivers together even more! We view play as a fundamental building block for preparing children to read as well as the general development of any child. Observe: Understanding what your child wants or what is going through their mind is difficult. Taking the time to observe your child and see where their attention is focused on can help you share the moment with him/her. Wait: Waiting gives your child time to start an interaction or respond to what you’ve said or done. Waiting means three things: stop talking, lean forward, and look at your child expectantly. Waiting can be one of the most difficult things for parents/caregivers to do. Counting to 10 to yourself can help ensure you don’t rush. Listen: Listening means paying very close attention to your child’s words and sounds and ensuring that you don’t interrupt him/her. This can be difficult, especially when you are trying to figure out what your child is trying to tell you. We have many books and DVDs by the Hanen Centre that expand on OWL at the Cheshire Public Library in the Parenting Collection in the Children’s Room. Check them out today. You can also attend our parent workshop: Helping Your Child Learn. We’ll go over ways you can incorporate the practices into playtime, reading time, and everyday activities. Dinner and childcare will be provided. When you were growing up was there a subject that you were obsessed with? Perhaps you are a parent or caregiver and a little one in your life has a similar obsession. Maybe you want to teach your little ones about your favorite subject, or you are a teacher and want to introduce a subject or idea. We have a simple answer for all of this, we call them Lit Kits. 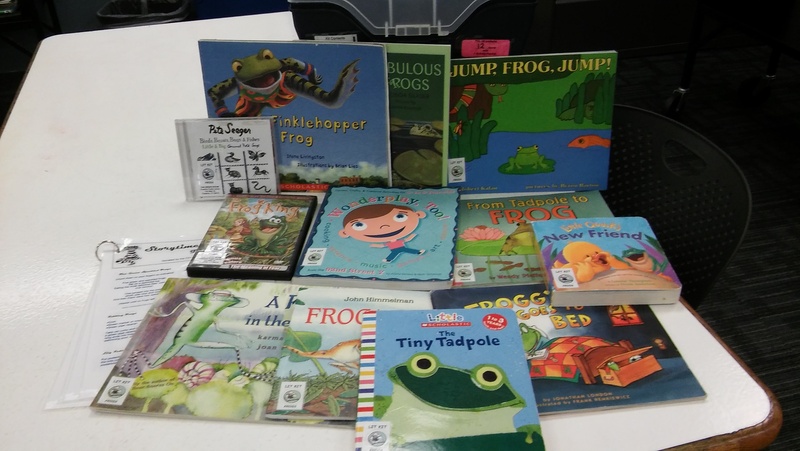 A Lit Kit is a box that includes a DVD, CD, book of related activities, picture books, and board books on a given topic. The collection of materials circulate in a blue storage box for the standard 28 day period, the same check out time as out regular books, CD’s, and audiobooks. They are the perfect solution for entertaining and teaching our youngsters. 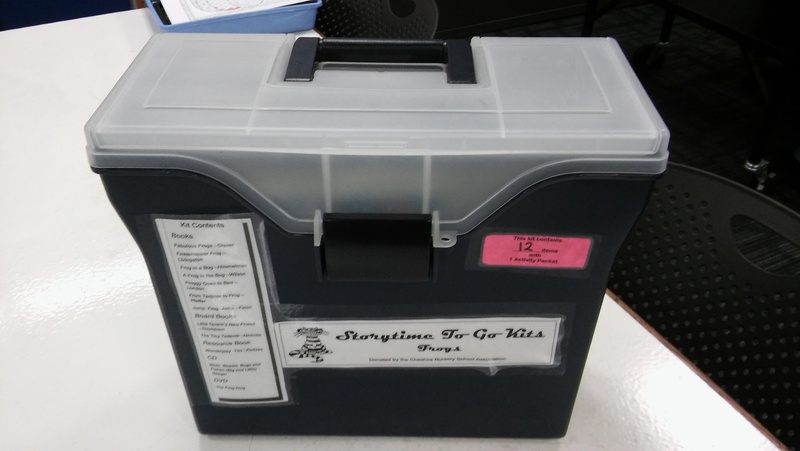 We currently have 40 Lit Kits in our collection, with plans for adding more. You can place holds on the kits if the subject you are looking for is checked out. 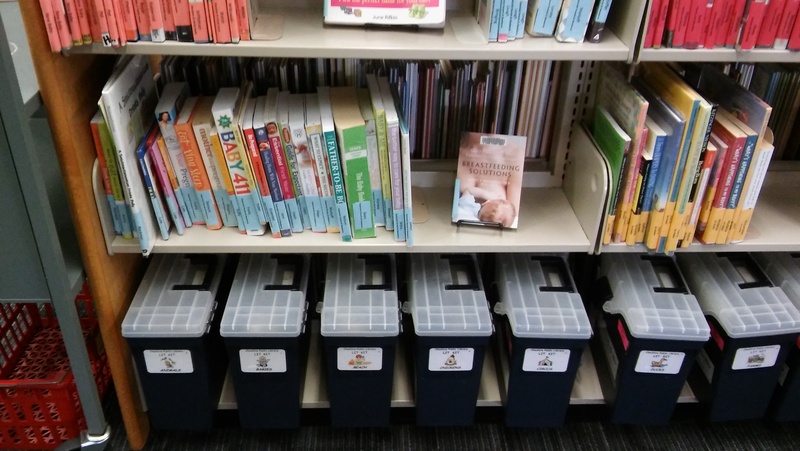 Our Lit Kits are located on the bottom shelf of the book case that houses our Parenting collection. Our Lit Kits include: Firefighters, Babies, Birds, Apples, Winter, Shoes, Spring, Food, Sleeping, Chickens,Fish, Fish #2, Transportation, Wheels, Rain, Friends, Monsters, Frogs, Summer, Colors, Dinosaurs, Animals, Families, Nursery Rhymes, Circus, Clothing, Pizza, Teeth, Shapes, Monkeys, Cats, Fall/Autumn, Bears, Dogs, Princesses, Bugs, Farms, Sports, Beach, and All About Me. We are planning on building more kits, so if you have a suggestion for a subject please share it here.